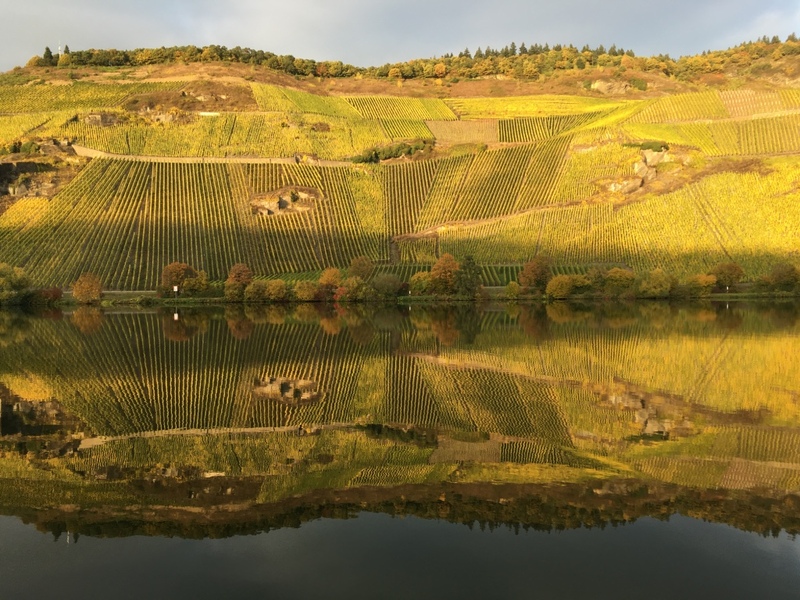 Professor Ian Cooper, international business author and travel writer, experiences the Romantic Rhine and Moselle, from Amsterdam to Basel with Scenic river cruises. I’m sitting on the top deck of our river cruise ship, feeling very relaxed, sipping a Kir Royale and trying to distinguish between the real and the reflections of the spectacular colours of the vineyards as they merge into the mirror-like Moselle river. 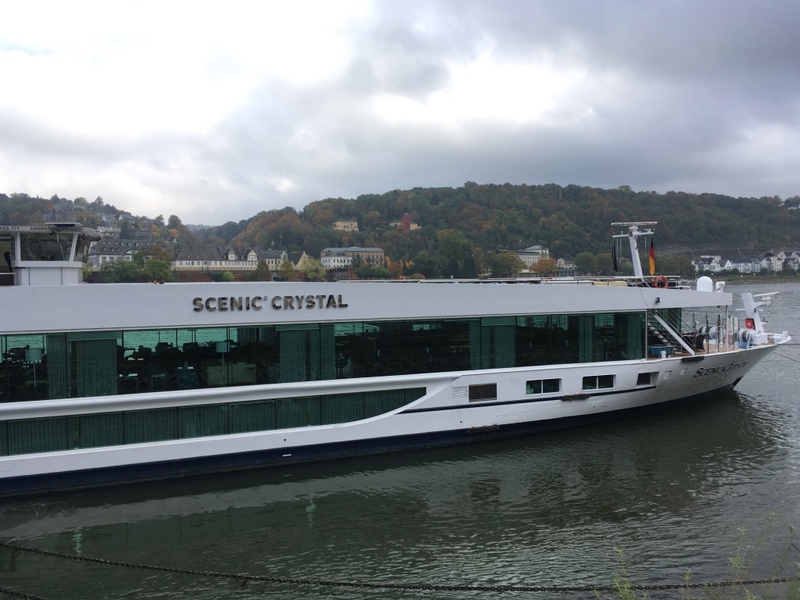 It’s no wonder river cruising has become so popular and that our vessel is aptly named the ‘Scenic Crystal’. Our epic 14-night river cruise adventure on the Rhine and Moselle rivers visiting five countries begins with a very short flight from London to Amsterdam, followed by a seamless private pick-up and transfer to our ship. One of a fleet of ‘Scenic Spaceships’ … so called because of their space-to-people ratio … the Scenic Crystal, with around 120 of us on this trip, is luxury river cruising at its best. Our balcony suite, to use its official marketing jargon, gives us a sumptuously comfortable huge bed; a high-tech bathroom with fancy lotions and potions; bathrobes and slippers; a safe big enough for a laptop; an enormous flat screen TV and an ingenious private verandah. We also have a butler, though in truth we don’t know what to do with him. My wife isn’t keen on him unpacking her undies and my trainers don’t need shining too often! Nevertheless, it is great to know that a quick call and our butler … I call him Aladdin … will magically pop up to carry out our every wish. Our fellow guests? Mostly 55-plus from varying backgrounds. We meet accountants, entrepreneurs, an ex-pilot, an author and a gold-miner. About eighty per cent are from Down Under, whilst most of the rest are from Canada and the UK. Everything about this cruise is informal. No dressing up for dinner and you can sit anywhere and with whomever you want at any meal. With such a small number of people, it doesn’t take long to make friends. The Australians have a favourite dinner topic. Without too much prompting, various couples tell us about the killer snakes and spiders in their gardens. “They are like pets after a while … you just stomp and they go away, but you musn’t put your fingers in their mouths”. Sounds like good advice to me! I have been lucky enough to sample various river cruise lines, but one of the distinguishing features about Scenic is ‘choice’. I have never experienced a more dazzling array of choices on any trip. For example, you can choose from a range of pillows; 12 types of teas and six coffees on tap 24/7; a never-ending supply of ‘free’ drinks and snacks in our mini-bar fridge; at least three optional included excursions every day and a very extensive range of wines and menu items to choose from at every meal. Even the shower involves serious decision-making. It has 14 separate settings. Apart from different water pressures and three nozzles aimed at various bodily parts, six special coloured lighting effects are on offer. When conversation over dinner about cruising, grandchildren and Australian wildlife wanes, the control panel on the shower always offers room for debate and analysis! What about the service on this cruise? Well, the truth is we feel more like guests than customers. A major contributing factor is the all-inclusive nature of Scenic’s business model. Once you have paid, everything is included. This is transformational in terms of the overall atmosphere and customer experience. The backbone is the cruise itinerary. Everyday as mentioned, there are usually three main excursion choices, all included in the cruise price. Alternatively you can stay on the ship and enjoy its facilities; go for a walk and use the special Scenic Tailormade handheld audio touring gizmos, that we all have, or even take advantage of the electric powered bicycles that the Scenic Crystal makes available to guests. We opt for a guided walking tour to see the historic sights of Antwerp, whilst many chose to travel to Bruges to sample the atmospheric canals and cafes serving the best hot chocolate on the planet. – Veere, a charming Dutch village with a strong Scottish influence and quaint shops and houses. – Nijmegen, the oldest city in the Netherlands with Roman origins, folklore legends and a bustling shopping area. – Maastricht, famous for its European Union treaty and distinguished by its medieval-era architecture and Romanesque Basilica. – Busy Koblenz, with a spectacular cable car ride to the Ehrenbreitstein Fortress. – Attractive Cochem with a visit to the fairytale-like Reichsburg Castle and enough leisure time to manage two café visits for coffee and Black Forest cake. – Rudesheim for a tour of Siegfried’s musical museum, and a chance to sample the famous speciality Rudesheim coffee consisting of Asbach liquor; three sugar cubes; hot coffee; whipped cream; vanilla sugar and grated chocolate. Oh yes, you can also opt for a cold version with three scoops of vanilla ice cream thrown in. I do! – Heidelberg and its castle made famous in the film ‘The Student Prince’ starring Mario Lanza. – Strasbourg, with its European Parliament institutions, very impressive cathedral and historic astronomical clock. 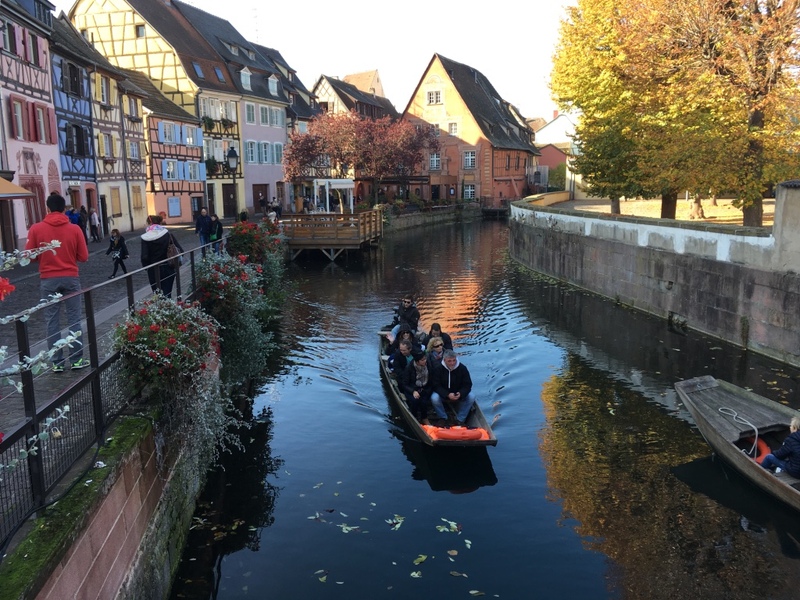 – Charming Colmar and its fascinating half-timbered houses and the beautiful old canals area known as ‘Little Venice’. Too soon, this wonderful 15 days adventure finally comes to an end in Basel, where before we leave, the ship’s captain is keen to give my wife and I a private tour of his bridge. As a parting piece of philosophy, he insists on taking a photo of my wife sitting in the ‘captain’s seat’ so that … “it will remind you of who is really in charge when you get home!” As if I need reminding! The Romantic Rhine & Moselle river cruise showcases the best of the Rhine and Moselle Rivers. Return flights from a selection of up to 15 UK airports, or Eurostar. 14 nights in a suite of your choice, all with river view. Complimentary premium branded drinks all day. Five dining options, from casual to fine dining. 41 meals including 14 breakfasts, 13 lunches and 14 dinners. Up to 19 flexible Scenic Freechoice excursions to choose from.